Powerful Yet Simple Liturgy Preparation. A service of GIA Publications, Inc. Need help teaching your cantors the psalm of the week? Want to familiarize your choir with a new anthem? How about encourage practice outside of rehearsals? Well... Simple, powerful, and effective just got even better! Along with the already great features of GIAPlanner.net, now you can listen to full recordings and clips of available selections, plan your liturgies, and share it all with your entire music ministry. Access Sunday-by-Sunday music suggestions for the most popular and highly respected GIA hymnals, including, Worship 4th Edition, Gather 3rd Editon, Lead Me, Guide Me 2nd Edition, Gather Comprehensive 1st and 2nd Editions, Ritual Song, and Catholic Community Hymnal and representing a wide range of publishers. We've also included the Guimont Lectionary Psalms, Cry Out With Joy and the Lyric Psalter. Connect your music selections to the readings of the day, supporting best practices in liturgical planning. Email liturgy plans to your team with the click of a mouse, or create convenient printouts. Add your own notes and comments and share them with your team. 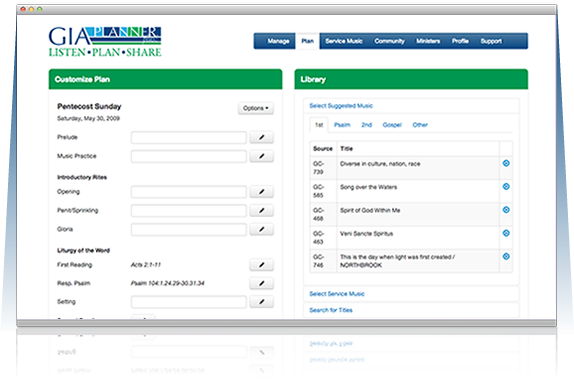 Elect to publish your plans, with streaming audio, to your church's custom domain name (yourchurch.giaplanner.net). View, import, edit, or rate plans created and published by fellow planners. Enjoy drag-and-drop convenience and time-saving power. Survey choral music suggestions from the experts. Copy your liturgies and see your plans at a glance. Gain insights on the readings with commentaries by Fred Moleck.